Our bookends have been the talk of all of our shelves. They are hand painted resin that will last a lifetime. The details are hand crafted by hand. Each measuring approximately 7.25 inches tall, this Dragon Bookend Set is made from cold cast resin with a hand painted stone finish. Each measuring approximately 8 x 5.75 x 7.75 inches, this Dragon Bookend Set is made from cold cast resin with hand painted details. Lending a noble air to any book collection, our owl bookends are as sure footed as they are beautiful. These collectible, heavyweight bookends feature non-slip felt pads. The hefty, high-brow owl has yellow glass eyes. This Greenman Bookend Set will give you many years of pleasure holding your books. Add a touch of fantasy to brighten up home or office library. Hand painted and polished cold cast resin. Approximately 6 inches tall. These Steampunk Dragon Bookends come as a set of 2 and measure approximately 10 x 5 x 7.5 inches each. Made from cold cast resin with hand painted details. This bookend has two flat surfaces so that it will work on either side of your books. He prefers fiction. The bottom has a non-slip pad. These bookends are sold individually, to receive a pair of them, please purchase 2. This Stone Dragon Bookend from Windstone Editions is perfect for keeping your fantasy books in line. Non skid bottom. 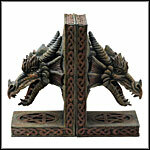 This Stone Dragon Bookend, Right Side, from Windstone Editions is perfect for keeping your fantasy novels in line. Non skid bottom. Copyright © acostumehouse.com 2019. All Rights Reserved.